My plan to test cashless in New Zealand were boring. It’s too easy. The place is almost cashless already. Having had the opportunity to spend a few days in New Zealand and having been involved in a few different conversations with different organisations down there I thought it might be of mild interest to report back on how they are getting on on the road to cashlessness. I’ll spoil the ending by telling you that they’re doing pretty well. I’ll get back to that in a moment. The other experiment I was conducting on that trip was to play around with the new Travelex multi-currency cash card. I’d seen it advertised at the airport a couple of times that struck me as being mildly interesting and since one of the currencies that it advertised was the New Zealand dollar I thought I’d give it a try. So I got one at Heathrow on the way out and loaded some NZ dollars on the card with the intention of comparing the exchange rates for loading dollars directly to the card with the exchange rate for using my UK credit card in New Zealand. Remember, I do this so you don’t have to. 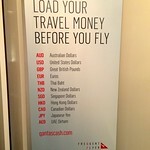 As another aside which has no real bearing on the narrative, when I got to Sydney I noticed that Qantas were advertising a similar product in their lounge which was combined with their frequent flyer card and had quite a wide range of currencies. This struck me as rather a fun idea. If British Airways combined the Travelex card or something similar with their British Airways Executive Club card (I always have in my travel wallet anyway) then, hopefully, I could have got one without having to go through all of the relevant junk “know” your customer stuff at the airport. I say that because I did find getting the card a bit of a pain. I went over to the Travelex desk and assumed that I would hand over 50 quid and be given a card that had 50 quid’s worth of NZ dollars loaded onto it but because of the stringent Know Your Customer, Anti-Terrorist, Anti-Money-Laundering and other pointless and dreary regulations I had to fill out a form then wait while they painstakingly typed the stuff from the form into a website and then typed in some more stuff about the card they were going to give me an so on and so forth. It wasn’t quick or easy to get a prepaid card loaded with a couple of hundred NZ dollars. I had to fill in an application, hand over my passport (which was then photocopied) and provide mother’s maiden name (I always give an invented one, for security purposes). I suppose it took 10-15 minutes. All of this despite the fact I wanted about a hundred quids worth of foreign currency and have been a customer of Barclays Bank for 37 years. Surely my debit card and PIN should have sufficed? Stifling innovation will be the major consequence of this action, Shanahan said. “This will slow down the creation of new programs. Ironically, it’s good for the people who are already in.” The higher the bar set by regulators, Shanahan said, the more the advantage swings to players with established compliance programs. I do wonder if a normal member of the public would really bother with all of this but anyway, I did, so I had the card. At which point I remembered that they told me on Twitter that it doesn’t come with app so to check the balance you have to log in on the web. But the point is, I had one, so when I went out of the hotel I went to an ATM to change the PIN on the Travelex card (which as it turned out, I couldn’t do) and draw out some cash just to see that worked. Which it did, perfectly. That is how I came to have some NZ dollars in my pocket when I went to the convenience store. And so we can return to the story. …proffered a $20 bill alongside the deodorant. The clerk to my surprise and delight told me that they did not accept cash after 7pm and that it was cards only. So I bought a large chocolate bar as well to reward the store for their forward thinking policy. Thus, there was not a single shop, restaurant, taxi or fast-food joint I visited that needed cash. I saw plenty of contactless terminals and even a couple of vending machines that accepted mobile payments, contactless cards and (bizarrely) coins. 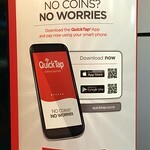 I wanted to give QuickTap a try because it looked quite interesting but when I tried to download the app, nothing happened. Maybe you have to be logged in to the NZ iTunes Store or something ridiculous like that. New Zealand is an advanced country that illustrates one of my all-time favourite quotes, from William Gibson’s brilliant “Count Zero” Grafton (London: 1987): It wasn’t actually illegal to have [cash], it was just that nobody ever did anything legitimate with it. The future may well be unevenly distributed, but some of it is in New Zealand. Oh, and as for the exchange rates, the NZ$ I loaded to my Travelex multi-currency cash passport were at 1.77 to the good old Pound Sterling, whereas when I used I my Amazon MasterCard to pay for dinner in Auckland the effective rate was 1.88 including the currency conversion charge.